So, have you noticed that people’s attitudes change during the holiday season? The bitterness and divisiveness of the midterm elections fade away, and hope and good will towards man emerges; although, one could claim it is because of the rum-laced goodies. However, the answer is explained through astrology because the bulk of the holiday season happens during Sagittarius season, which by the way, begins this week. In Kabbalah, Sagittarius season is the month of miracles. The word for Sagittarius in Aramaic means rainbow, and of course, biblically the rainbow is associated with the story of Noah’s Ark. After the great deluge (Scorpio), God creates a rainbow as a spiritual force that counterbalances judgment. So, the regeneration and transformation that occurs while the Sun is in Scorpio are replaced by a rainbow, the symbol of hope and new beginnings. Now ‘miracles’ is a curious word. Many religious philosophies believe it is something granted without any form of effort, like a cosmic lotto. But there is much more to miracles than simply coincidence. The mystical sages teach us that by connecting with the natural laws of the universe, you create your own miracles, which is receiving to share with others and being compassionate rather than judgmental. Essentially miracles, like the word luck, are fundamentally Jupiterian (ruler of Sagittarius), and are created by understanding the natural laws of the universe, to tap into your intuition so that you can make the most of opportunities. Thanksgiving week begins with the week’s only major aspect – Mars square Jupiter. Mars square Jupiter is an energy powerhouse, so you will need to pay attention to everything around you, especially since this aspect is known to be accident prone. Both Mars and Jupiter are fiery planets, and they tend to focus on the future rather than the present because potential and possibility are all that matters. Mars-Jupiter aspects are good for project planning, examining goals, and aspiring to be better than you are now, but they are also impulsive, and its best to try to curb reckless behaviors as much as possible. Additionally, try not to push yourself too much because fires rage, but they also burn out, and so may you. The Moon moves through Aries continuing the potent energy from Monday. There will be some minor hiccups when the Moon opposes Venus and Uranus. During the morning hours, difficulties with others may occur, especially if they thwart you from getting what you want. Try to avoid confrontation for now because Mars square Uranus could inflame the situation beyond control. Later Tuesday afternoon, the Moon will conjoin Uranus, and you may feel anxious and on edge. The good news is that the Moon quickly moves into Taurus and thorny emotions calm down. Wednesday, November 21, 2018 After two raucous days, the Moon in Taurus should settle things down rather smoothly. Wednesday is a great day for business with the Moon forming a lovely trine to Saturn. On Wednesday evening, the Moon forms another beneficial aspect, this time to Neptune, so it’s a great evening to rest and relax before Thanksgiving. Keep in mind that Mercury is retrograde, and communication snafus are bound to happen. However, during the early morning hours, the Sun moves into festive Sagittarius, which should keep the mood positive. The Moon moves through Taurus, so your dinner should be delicious, and you can even have some guilt-free seconds and an extra slice of pumpkin pie. Save some cheesecake for me! The Full Moon occurs on Friday in Gemini, the sign of the twins. New Moons are the astrological time of the month to bring in the new, and Full Moons augur getting rid of the old, based on the Moon’s sign. The main theme of Gemini is communication and thinking because essentially Gemini is a mental sign. The Full Moon in Gemini will show you the areas of your life where communication may be difficult or problematic, which is amplified by Mercury retrograde. So, pay close attention over the next few days because areas that need focus will come to your attention rather clearly. The Full Moon in Gemini is a powerful time to remove blocks between yourself and others; after all, the main purpose for communication is to develop relationships. Friday is also the biggest shopping day of the year. The Moon moves through Gemini, but forms only challenging aspects, which could make shopping lines long and aggravating. You might be wise to leave shopping for another day. If you saved black Friday shopping until the weekend, Saturday is decent. Although the Moon remains in Gemini, it forms a lovely trine to Venus in Libra. Libra loves peace and harmony, so engaging with other shoppers will be more comfortable. On Sunday, the Moon moves into emotional cancer, and the comfort of your home may be your best bet. After an intense week, a day of relaxation may be in order. Happy Thanksgiving! See you next week. 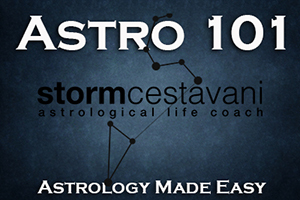 This entry was posted in astrology on November 17, 2018 by Storm Cestavani. So, I have some good news and some bad news. The good news is that the never-ending train of retrograde planets will end soon, in fact, Venus goes direct this week. The bad news is that the day Venus goes direct, Mercury is going to retrograde in fiery Sagittarius. So, the caboose of the train is in sight, we just have one more three-week cycle to manage. Of course, I am sure that you guessed that the newsmaker of the week is Mercury. Before Mercury goes retrograde on Friday, make sure you wrap up any holiday plans you have, sign anything that needs to be signed, and backup your computer. The traditional areas of concern are relevant this retrograde cycle: do not sign documents; do not make large purchases; do not formalize any agreements; do not start anything new; if you must travel, expect problems with automobiles and appliances. There is one little tip that you may not know about Mercury retrograde, when he is retrograde he is great for deals and bargains, so do not be afraid to haggle a bit. Once Mercury retrogrades in Sagittarius, there will be a few days of stagnant energy before Mercury begins to move again so you may feel restless and drained, and frequently it is easy to get caught up in the details. All retrogrades reflect periods where you need to reflect, and this one is no different. The difference in Sagittarius is that this retrograde season it is necessary to focus on revising your big picture and making it more adaptable to your current life. Do you have goals that have become unmanageable or you feel are beyond your grasp? If so, then you may want to break them up and make short-term goals that are achievable and then build upon them. You may also be confronted with a cosmic slap in the face when you realize your ideas have been wrong, and you need a course correction. Regardless, Sagittarius is about vision, and you may need to tweak yours during this cycle. Additionally, try not to get caught up in so many details that you lose track of the big picture entirely because this will only lead to feelings of defeatism and possible depression. Try to stay as inspired as possible. The Moon moves through earthy Capricorn and tangles with Pluto during the afternoon hours. Intense emotions may surface that may frighten you. Avoid obsessing about anything that comes up. Later in the afternoon, the Moon will sextile the Sun and any emotional turbulence will begin to fade. Do something with your social circle to distract yourself temporarily from your concerns. During the morning hours, the Moon forms a frustrating aspect to Uranus. Your emotions will be all over the place and you may feel stir crazy and anxious. The good news is that the Moon is void of course, so anything that you worry about will not materialize as badly as you expect, and most likely nothing will come of the matter. Additionally, the Moon will quickly move into social Aquarius and forms a lovely sextile to Jupiter. You may receive good news during the afternoon hours. There are no major aspects on Wednesday, and the Moon only forms a beneficial aspect to Mercury. Wednesday is a great day to reach out to your business network or for developing relationships in your career. Invite a colleague out to lunch because your career circle will prove useful in the future. Thursday is the biggest day of the week, astrologically speaking. There is a harmonious aspect between Mars and Uranus, and then Mars slides into Pisces during the late afternoon. Let’s begin with Mars in Aquarius sextile Uranus in Aries. All Mars-Uranus aspects are a bit ‘in your face,’ but sextiles (beneficial aspects) are easier to manage. You may feel impulsive and in need of change throughout the day, and areas of your life that feel stuck may become noticeable. Although you may feel irritable, Mars sextile Uranus can often give you enough energy to burst through problems in your life and set you sailing on a new course or direction. This push can often come from people in your life that may challenge or inspire you to move to the next level. This aspect is about encouraging change in your life that is innovative and individualistic, and it does so by shaking things up that are stale and stagnant. The good thing with Mars-Uranus aspects is that it always gives you the energy to make the changes necessary to succeed. Next, Mars moves out of Aquarius and into Pisces. Since March, Mars has been in Saturn ruled signs. This Saturnian influence can make life feel restrictive. Mars is the getup and go planet, but with Saturn’s control, it can feel like you are driving with the breaks on, especially if you are a fire sign (Aries, Leo, and Sagittarius). However, Mars’ tone changes when it lands in Jupiter ruled Pisces. Mars in Pisces is the spiritual warrior and with this placement, you will feel more compassionate, empathetic, and generous with others, which is great during the holiday cycle. Mars in Pisces needs to feel support by others, and you will strongly need validation those you care about. This Mars cycle is great for creative work because your imagination will be ‘more’ active than normal. The only drawback to Mars in Pisces is that the energy can be a bit erratic. So, you may need force yourself to be more focused than you ordinarily would. Mars remains in Pisces until December 31, 2018. During the morning hours, Venus will turn direct in Libra. Pressures and strains on your relationship should begin to recede over the next week. You will be able to repair any damage to relationships that may have occurred, and if you did the work during the retrograde (see Venus blog), then you can make the necessary changes to improve any relationship difficulties discovered. Since Venus is in Libra, the sign she rules, moving forward will be harmonious because Libra is the natural diplomat and seeks order and balance. Now just a gentle reminder, as I stated earlier, Mercury will turn retrograde on Friday evening. Don’t forget to finalize plans and back up your computer. For magical practitioners, I recommend Van Van candles and blockbuster magic to minimize the effects of the retrograde. The Moon moves through emotional Pisces for the bulk of the weekend. You will be sensitive to other people’s feelings and may be called upon by those in need. Otherwise, it’s a great weekend to get all your Thanksgiving festivities in order. This entry was posted in astrology and tagged astrology, horoscopes, Mars in Pisces, Mars Sextile Uranus, Mercury in Sagittarius, Mercury retrograde, Scorpio Season, Storm Cestavani, Venus direct, Venus in Libra, Venus Retrograde on November 10, 2018 by Storm Cestavani.